No matter what you do or where you go, there is just no escaping the fact that everyone dies one day. Death is a very, very popular search topic on the internet and book stores are overwhelmed with media about death. Not only is it a popular topic in these outlets, the Bible has lots to say about death as well. 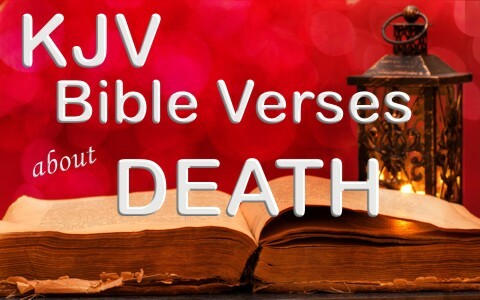 Take a look at these 20 KJV Bible verses about death and dying that I would like to share with you. Philippians 3:20-21 20 For our conversation is in heaven; from whence also we look for the Saviour, the Lord Jesus Christ: Who shall change our vile body, that it may be fashioned like unto his glorious body, according to the working whereby he is able even to subdue all things unto himself. Romans 5:7-8 For scarcely for a righteous man will one die: yet peradventure for a good man some would even dare to die. But God commendeth his love toward us, in that, while we were yet sinners, Christ died for us. 1 Corinthians 15:51-54 Behold, I shew you a mystery; We shall not all sleep, but we shall all be changed, In a moment, in the twinkling of an eye, at the last trump: for the trumpet shall sound, and the dead shall be raised incorruptible, and we shall be changed. For this corruptible must put on incorruption, and this mortal [must] put on immortality. So when this corruptible shall have put on incorruption, and this mortal shall have put on immortality, then shall be brought to pass the saying that is written, Death is swallowed up in victory. It has been said that when you are born twice (physically and spiritually) you die once. The opposite is also true, if you are born only once, you will die twice (John 5:28-29). Do you choose life? Come to Jesus today for tomorrow may be too late. Take a look at this related article: What Does the Bible Say About Death?